Felix played steady down the fairway to make the green in 3 (using irons all the way) and 2 putt bogey. Leigh had a couple of missed shots and putted in for 8. Felix duffed tee shot and just made it past the ladies tee, then recovered well to 2 putt for bogey. Leigh had a nice drive down the line, his second shot gave him an awkward chip off a bad lie and had to go over a bunker – which found the bunker across the green. Leigh tapped in for a 7. Both players played steady for bogey to square the hole, with Felix hitting a nice approach to the green from miles away on another fairway. Leigh pulled out the Craven wedge from about 40m out to get near the hole. Felix duffed his tee shot and then found the bunker with his second. Leigh found the dam off the tee, took a penalty drop and then played a great chip onto the green (somehow making it stay on the green downwind). Felix took a couple of bunker shots to get on the green. Both players 2 putting and Leigh takes the hole with a double bogey. By now the nerves are settling and the good shots are starting to flow. Both went large and straight off the tee, with Felix finding a tree across the other side of the fairway. Leigh nailed his approach to be on the green in reg. Felix had to swing his second shot through branches and leaves and made it next to the green. Leigh 2 put par takes the hole (coming very close to a birdie). All square – we have a match. Leigh down by the green for 2 and just off the back for 3, Felix found the trees on the right, but made it to just off the green for 3 (over the back)….and then…..he putts onto the green…..and its going for the hole…. and it drops straight in the middle of the hole for a birdie. Leigh’s birdie try burns the hole but stays out. 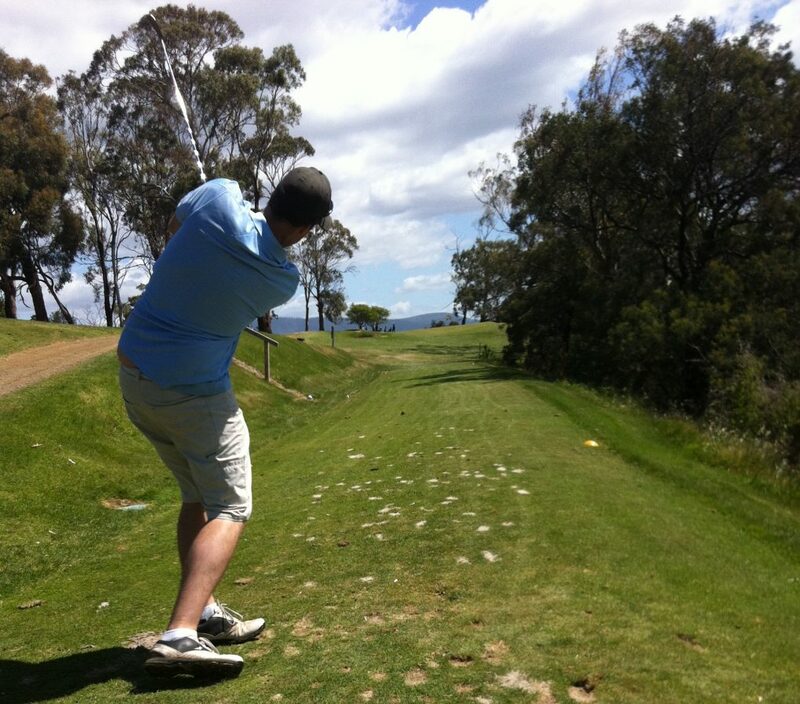 Both players found trees off the tee and had to chip sideways onto the fairway….ending up next to each other. Felix made the green on approach and Leigh just off. Felix made bogey and Leigh had extra chips. Both players took 3 shots to get on the green and then 2 putt, with Felix having to get a little creative to get out of the trees, to square the hole. Leigh found the trees right off the tee and had an air swing and a couple of extra shots to get there. Felix nailed a 3 wood down the fairway and then played steady to make a bogey. Felix 3 up…..at the half way mark, the Aurora curse is starting to surface…or is it? Leigh played 2 good shots to be just off the green and then pulled out the Craven wedge to get on the green and then drained a long putt to make par and take the hole. Felix found the fairway bunker and then played steady to make a bogey. Both players missed the green. Leigh had an extra chip to get on the green. Both 2 putted, for Felix to take the hole. Both players found the trees on the right, Leigh on in Reg but miles away. Leigh 4 putts, Felix with 2 putts, wins the hole. Felix duffed his tee shot into the bushes (not making it past the ladies tee), but found it and chipped out sideways to make his way to the green for a double bogey. Leigh found the pine trees on the right off the tee. He must have liked them, cos he stayed in them for a few more shots and made it to the green to putt out for a few more than Felix. Felix 5 up with 5 to go…he can’t lose. Both players found the water hazard on the left off the tee. Leigh recovered well to get up and down for a double bogey to take the hole. Felix had a chance to win the day by making a long putt, but it didn’t drop. Felix found the trees left off the tee about half way to the hole, Leigh hit a great 3 wood to be just off the green on the right. Leigh chipped on to make a bogey and take the hole, as Felix took and extra shot to get on the green. Felix had a chance to win the day by making a long putt, but it didn’t drop. Felix 3 up….can Leigh come back? Leigh played steady to make the green in 3 and 2 putt for bogey. Felix had a duffed shot along the way to be on the green for 4. Felix had a chance to win the day by making a long putt, but it didn’t drop. Leigh wins the hole. Felix 2 up with 2 to go…is this going to be the comeback of the century? Leigh’s tee shot made the fairway, but was about 150m out from the green, his second shot found the bunker left with a horrible stance. Felix bombed a 3 wood down the fairway to be within 50m of the green. He chipped onto the green, but a long way from the hole. Leigh had to hit out of the bunker and get close to the pin and hope Felix 3 putts to keep the match alive….Leigh swings…and the ball didn’t come out of the bunker, but the second one did. To win the match Felix now has the luxury of 3 putting. He calmly steps up to the first putt and hits a nice 25 footer to within a foot of the hole and then taps in to win the match. Felix wins 3 and 1 to be the first on tour to go back-to-back-to-back…a three-peat – the 3 wood off the tee was the winning move. Fox Sports coverage starts at 12 noon, with a puff piece on Basil the World Number One, followed by interviews with various occult experts examining the Aurora Curse, followed by highlights of Ian’s 2 wins and Felix’s 2 wins, then some analysis of the season so far on the Gentlemen’s World Tour including predictions for Player of the Year (Lewah looking good) and Rookie of the Year (Stu), then at 1pm it shifts to live footage from the practice range and comments from our special correspondent on the day Lewah, 1:15pm its a hole-by-hole breakdown of the players strengths and weaknesses and a predicted result, followed by 1:30pm tee off and into it. The coverage then rolls for 4 to 4.5 hours until the match is decided. Then the post show, live from the Royal Hobart function room, and interviews with both players. Coverage wrapping up at 7pm. Posted on December 19, 2016 February 7, 2017 by Gentlepersons' World Golf Tour, Tasmania	This entry was posted in Uncategorized and tagged golf, royal hobart gc, tasmania. Bookmark the permalink.